There's always a pig over the pit. Sometimes it has skin, sometimes it doesn't. Sometimes it has a head, apparently this year sometimes not (you can thank me later for sparing you of that picture), and sometimes, like last year, people think it's funny to put lipstick on the pig to express their political points of view (my family is politically divided and I won't tell you which side I'm on). 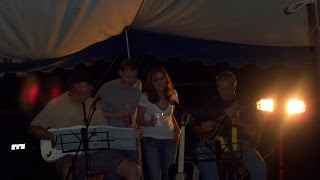 There is always drinking which leads to singing a variety of tunes from the Blues, to old timey songs, to Rock, and country. There are the people who stay up all night to tend to the pig, the people who camp out at there own risk of being harassed in the middle of the night by the people who are going without sleep, and the people who smartly find their way home to cozy beds. 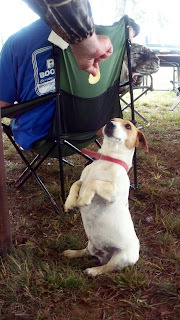 There apparently will always be this cute little dog who has somehow shown up to our event for the past 2-3 years. No one knows who he belongs to, but apparently he is on our email list and always joins in on the fun. There is always a variety of weather. Sometimes hot, sometimes freezing. 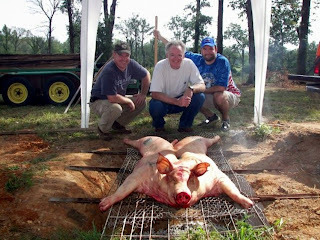 Sometimes it rains and sometimes it's just plain muddy, but no matter what, there will always be a pig roast. Rain or shine we make sure we have an amazing time! Holy smoke, Laura!! That pig is HUUUUUUGGGEE!!! Wow!